GALLERY 21, SPANISH VILLAGE, BALBOA PARK, SAN DIEGO, CA. Cynthia Stafford is a realist sculptor born and raised in San Diego, California. 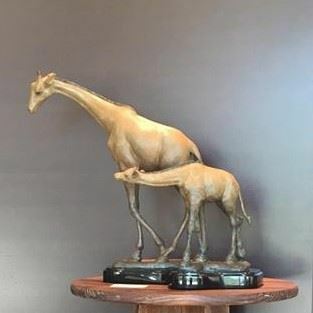 In her early adult years she sculpted animal figurines for the company Living Stone Inc. As her skill level grew, so did her love for the medium and she pursued other forms of expression in clay. She took her first figurative sculpting class under the instruction of Mary Buckman. Then she continued her training under the instruction of the late A. Wasil. Eventually Cynthia assisted Mr. Wasil in sculpting the clays for several projects which were later bronzed and installed at different resort hotels. She continues to learn and grow from her home studio in Bonita, CA. A winner of several awards and three-time finalist in the prestigious International ARC Salon for her sculptures, she is currently dedicating time to bettering her understanding and skills in oil painting. Whether painting or sculpting, it is the process which brings Cynthia the greatest joy. Her interest in art began when she was quite young. Her mother was a prolific oil painter and crafty in general. She had plenty of how to books and art supplies readily available for her cildrens’ use. Art was always around Cynthia. The first time she found herself interested in sculpture was so unexpected. While playing with the neighborhood kids, and running through a friend’s living room to get to the backyard , she stopped in her tracks when she saw this beautiful figurative sculpture in clay sitting on a table. Their father was an artist and Cynthia was awestruck. After a few questions she went on her way again. But that moment will always remind her of when she fell in love with sculpting. She has made sure to surround herself with art. Whether it be work she is creating, books on the subject, social media, or admiring other artists work, everyday she looks forward to learning something new on the subject. Inevitably, it happens.